As many of you probably saw in the Albuquerque Journal last week, Marble has finally broken ground on their long-awaited brewery expansion downtown. The Crew was not able to attend that ceremony, but Marble was kind enough to invite us over for a sit-down with co-owner/brewmaster/mastermind Ted Rice on Wednesday afternoon to go over the many, many details of this expansion that could not fit in the newspaper. Needless to say, Ted had a lot of information to share, ranging from the timetable on the new building, to how many barrels they hope to produce in the future (think twice what they make now and then a little more on top of that), to future seasonal releases (many more favorites will be bottled), to the future rooftop patio, and a whole lot more. So kick back, pop open a bottle or can of Marble beer, and read on. If you love Marble, this is all going to make you happy. NMDSBC: I saw the fence is up, the dirt is being moved, this thing is finally underway. After all the headaches, all the delays, it has to feel pretty good. Ted: We originally drew up these plans back in 2011 and for a variety of reasons it didn’t come together. So here we are in 2015 and I definitely do not want to install another tank outdoors. So strong push to get this expansion done. There’s motivation (coming from) a lot of directions. The demand is there. It’s as clear as day. Let’s invest, let’s build this building and let’s create the space to brew the beers that people in this region are clamoring for. It’s a huge weight off my shoulders to have it all fenced off and just the bulldozer out there, just moving dirt around. It’s a five-month project. We should have our certificate of occupancy in late November (or early) December. We’re going to fill the tank with equipment as fast as possible. So the space is 7,000-square feet. We’re planning on housing 16 150-barrel tanks. There’s going to be a centrifuge in there as well. All of the beers will still be unfiltered but they’ll run through the centrifuge for clarity. Right now all of our beers are currently unfiltered but we’re transferring with finings and allowing the beer to settle over a 24-hour period of time. The centrifuge is definitely going to increase our yields and also reduce our overall production time. Also in the new space is going to be a new distribution cooler for kegged and packaged beer. 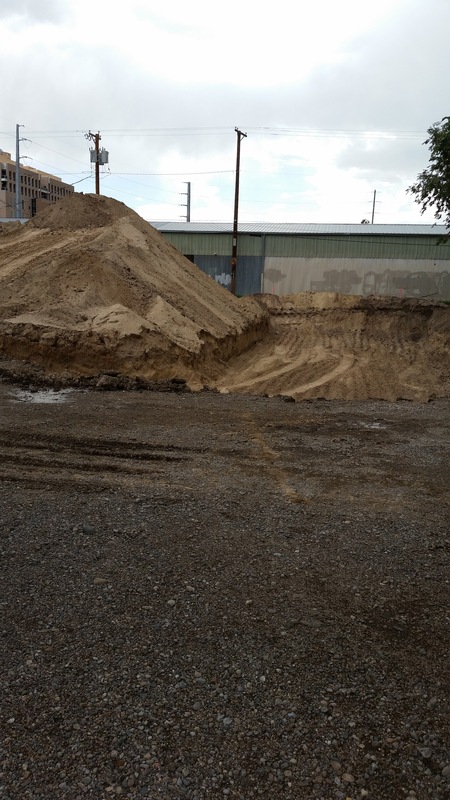 We’re going to have two loading docks. Right now it’s kind of a circus where we’re taking over Marble Avenue with our ins and outs of materials. So that’s going to be nice for us, nice for our neighbors, a lot more streamlined and efficient. And then on top of the pub cooler, so right now the pub cooler is outside, that’s going to be housed in the new space and we’re going to build a mezzanine on top of the pub cooler. That mezzanine is going to support a meeting room, a new lab, and also a brewer’s lounge. It’s going to be enclosed with glass so you’ll be able to look over the production space, over basically the fermentation hall. So the brewhouse is going to remain in the same spot where it is right now. We’re going to move pretty much all the fermentation into the new space. And the existing fermentation space is going to be the new packaging hall. I’m working with some consultants right now for laying that out in the most efficient manner possible. So we’ll go ahead and install a new canning line, a rotary filler, a new kegging line, and we’ll keep the existing bottling line. … It will make things a lot easier. It will take the tendonitis out of the operation. NMDSBC: So the main space, are you knocking the wall out at a certain point? Or will there be a separation of buildings there? Ted: What we’re doing is that door that led to the former distribution cooler, that’s going to be one open space and then we’re cutting a new 10×10 opening that’s going to be line up with the overhead door on the south side of the building by the silo. Then we’ll bring in tanks directly through those two spaces. Then we’ll bring the tanks in stand them up inside. NMDSBC: So are you going to do walls first and then put on the roof or do it all at once? Ted: So it’s a metal building and that’s being manufactured as we speak. How exactly it’s going to be erected I’m not quite sure. Right now they’re working on the foundation and then they’ll pop it all up just like an erector set. NMDSBC: So it’s five months on the projection? Ted: It’s a pretty good schedule. Enterprise Builders have been around for a while, they know what they’re doing. I’m very optimistic in that timeline. NMDSBC: When all is said and done, people are going to ask how much more beer will they be getting. So what’s the projected output when this is finished? Ted: So I haven’t added a new tank, a new piece of equipment in a long time. That stagnancy has been a really odd feeling. In the past we’re always buying valves, buying fermenters, installing pumps. Looking forward to that, in 2013 we did like 12,500 barrels, in 2014 we did 12,800, 2015 we’re not adding any new capacity, really all of that capacity is coming along in 2016, but for 2015 because we changed our product mix around a little bit and focused more on Double White and a little less intensive on the Pilsner side, this year we’ll probably do around 14,000 barrels. So looking at that product mix, what we’ll be able to do with increased efficiency and all these new tanks, probably between 30,000 and 35,000 barrels will be our capacity. What are we going to actually turn out in 2016? That kind of depends on how fast I can add equipment, train brewers, and fill distribution channels. But as I’ve been saying, kind of the first priority is let’s get some days on hand with National Distributing. Right now, the president of NBC was here for our groundbreaking party, and he was joking ‘here, look at this spreadsheet on my phone. This is how many days I have on hand for this supplier, this supplier, this supplier. You are three. You have three days on hand.’ So I want to get at least 30 days on hand at our supplier, I want to ramp up to that as fast as possible. One of the things we’re really excited about is having a seasonal release calendar mapped out for all of 2016. We’re still designing a lot of our labels right now. Right now we’re working on 111 Farmhouse, we’re going to work on Pumpkin Noir, we’re going to work on Stout Americano. I want to have all of those styles lined up for 2016 and what the release dates are. We have so many different specials that I love, I don’t want to make the release schedule too crowded. We have everything from Imperial Red to Imperial Stout to Reserve to Cuvee Rouge to White Out to Farmhouse, there’s a lot of stuff. I haven’t looked at them all and counted them all up. I want to be able to have capacity to do all of those beers throughout the course of the year. Further proof that the expansion is happening at Marble. That used to be the back parking lot. NMDSBC: So as the construction is going on out there because it’s a little bit separated, are operations in the brewery going to be going along as normal or will adjustments have to be made? Ted: As normal as we can maintain, yes. It’s definitely going to be a lot of hoop jumping and going in circles to get from A to B. For the most part we’re going as fast as we can, (hoping) for no bumps in the road. (Thursday) morning Josh (Trujillo) is getting here at 6 in the morning. He’s going to meet the crane to reposition fermenter 17. I don’t know if you saw the photo we had of 16. Now we’re moving the other one over. They have to do the excavation. So 17 has been dry-hopped, it’s all been cooled, it’s ready to transfer. We’re moving the beer (Wednesday night) out of that tank and then in the morning the crane is going to pick it up and reposition it. Then Josh has to do all of the plumbing, glycol plumbing and electrical. Then it’s going to sit there until basically November and then we’re going to move all of those tanks indoors. So yeah, we’re keeping everything rolling along to the best of our ability. We lost our distribution cooler for basically two weeks. We have to relocate our largest tanks. We have no room to work in the brewery, which you knew before. Thank god our distributor picks up at our doorstep three days a week. That definitely eases congestion a little bit. NMDSBC: As for other projects, as part of this or right after, the rooftop patio. How is that coming along? Ted: So that’s part of this financing, it’s part of this appraisal. We’ve delayed the rooftop deck project because we don’t want to tear up the patio during our busiest season. We have to put footings on the north and south sides of the building to support this independent steel structure that’s going to straddle the pub. So we decided it was in our best interest to push that project back. Ideally, what I’m going to push for is to have that rooftop deck finished and ready to go by spring of next year. NMDSBC: I was wondering how you were going to do that. The original drawing I saw looked like it was just going to be right on the roof. Ted: Yeah, the roof can’t support it. It’s a large, steal beams that sit above that building itself. NMDSBC: That makes sense. Besides, the weather in the fall will probably be better than the weather outside is right now. Ted: Well, it’s a three-month project so we’ll start essentially in January. NMDSBC: Is there anything else you’d like to add? Ted: Two new packaging products we’re going to introduce once we have the additional capacity are our Double White in 12-ounce cans and our Red Ale in 12-ounce cans. So the designs are all done for those and ready to go. There’s no need to introduce additional SKUS right now when we’re struggling to keep up with Double White, Red, and IPA. We look forward to that. NMDSBC: You said you’re going to add more staff with this, too. How many people are you looking to add or hoping to add? Ted: If we’re firing on all cylinders, to fill a 150 it’s five brews in a day. If you have 14 tanks, 14 150s and they’re on a two-week cycle, that’s five brews seven days a week. Right now we’re filling a 120, which is four brews in a day, once, maybe twice a week. 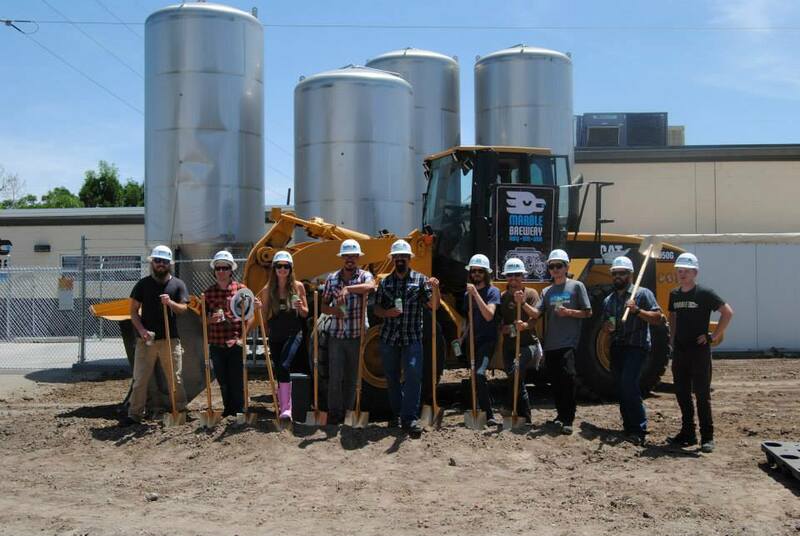 We’re going to have additional tanks besides the 14 150 fermenters and the two 150 brites. We’re going to keep some 60s and maybe a 15 or two so we can do some lagers and do some specialties that are not 150 barrels in volume. The point of my story is we’re going to be brewing around the clock. So I am going to be adding. We’re going to be promoting within, training guys that have proven themselves, bringing them up to the brewhouse platform. I recently added a brewer from California. It’s not going to be full-speed from the get-go, but we’ll ramp up to it. How many exactly? I can’t necessarily say. We are going to have some increased efficiencies. But it is going to be round-the-clock brewing, that’s for sure. So that’s the back-of-house side. The front-of-house side, there’s going to be additional bartenders and management for the rooftop deck. The rooftop deck is seasonal, too. We just added some professional grade stage lighting for our patio and some architectural grade lighting for the mural. So that was just installed last week and they’re doing the programming on that lighting now. So that’s really going to enhance the experience out there. So if you’re here in the evenings be sure to stay for the music. NMDSBC: So the total cost of it is $1.5 million? Ted: So that’s for the building itself. Then you have all the equipment that we’re going to be adding, the fermenters, the centrifuge, every clamp and gasket. So the total cost for the building and the equipment is I don’t know, but it will be in the millions. Thank you to Ted for taking the time to chat. He figures to be incredibly busy for the rest of the year, so we truly appreciate the time he took for us and for our readers. And thank you to Amberley Rice for setting all of this up. If anyone has questions about the expansion, you can send them our way at nmdarksidebrewcrew@gmail.com and if we cannot answer them, we will forward them to the Marble staff. In the meantime, we know you will all keep supporting Marble by purchasing their beer, visiting their two taprooms, and probably polishing up your resume in the hopes of one of those possible future jobs.